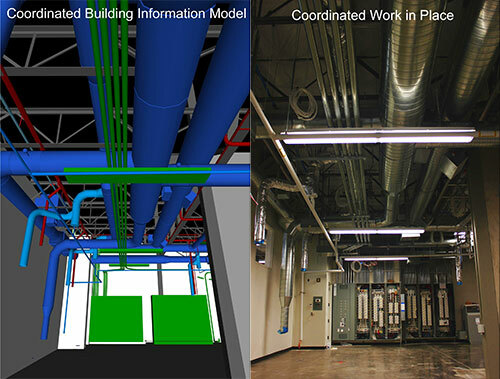 Kirtley-Cole has enthusiastically embraced 3D Building Information Modeling (BIM) technology and is capable of utilizing it for just certain components of a particular structure, or for an entire building. For new construction projects, whether fully designed or early in design development, we develop 3D models for key building structures and systems that allow us to avoid clashes between trades and reduce changes once construction has started. For existing structures and tenant improvement work, we can create a model of the existing space with laser scanning, which allows for a very accurate model of the structure. We then create 3D models for mechanical, electrical, plumbing and fire suppression systems to ensure all components coordinate seamlessly, thereby reducing both construction duration and cost. Regardless of the type of project, Kirtley-Cole has the VDC experience to provide our clients with the highest level of quality and the most efficient construction schedule possible.